State law allows for forced closure if the schools rank in the bottom 5% for academic performance for multiple years in a row. In this case, these schools have been at the bottom in 2014, 2015 and 2016. A final determination will come in late February or early March, after the school reform office decides whether closing any of the schools below would cause a hardship for students. If closing the school presents a hardship, the state will choose from a range of interventions the law allows. That could include a CEO taking over the school’s academics, the principal and half the staff being replaced, or the school being converted into a charter school. In a rational society, schools that are struggling so profoundly as those in Detroit are would receive an influx of funding and resources to turn the situation around. But in the new world order we live under in Michigan, schools are looked upon as business units to be jettisoned when they don’t turn a profit. I have long advocated for a “educational surge”, the education equivalent to a military surge where resources are poured in when the situation becomes dire. More resources for teachers. More resources for parents. More resources for administrators. An investment in crumbling infrastructure. An “all hands on deck” approach to rapidly turn the situation around. This is decidedly NOT how Republicans see things. Rather, they force schools that are already struggling to compete against each other and against better-funded for-profit charter schools that have far fewer legacy costs. It’s a Hunger Games-style approach that all but guarantees the collapse of traditional, neighborhood-based schools, schools that are an important element in keeping communities intact and vibrant. 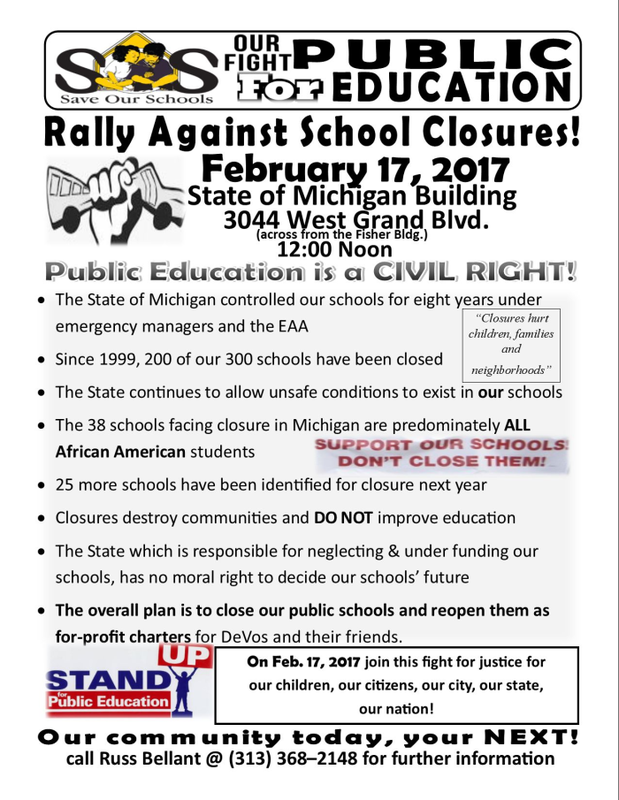 The protest will start at noon and will be held at the State of Michigan Building at 3044 West Grand Blvd. in Detroit, across from the Fisher Building.